This seems to be a very serious and widespread problem which could lead to user data loss. This is another thread about it. A reply would be very much appreciated. When dragging newer files (with same name as in the destination folder) from a compressed folder to a regular folder it looks like the file copy happens, you can see the transfer progress, but when you check after no files have been updated. Anybody else have this? It’s not clear if the reports are from the latest-latest version of 1809. Jenmsft has been copied on the Reddit posts. Remains to be seen if this new data-eating bug in 1809 will be fixed before it ships. This topic contains 22 replies, has 10 voices, and was last updated by anonymous 6 months ago. As Yogi Berra would say, “Deja vu all over again”. Unzipping archives is a common enough action done by almost everyone. This should be something that is always regression tested just in case, basic QA protocol type stuff. This problem points not to a failing of the external suckers aka testers but to a fundamental internal failure at MS. There is some basic QA work that needs to be done before any code is even released for more extensive testing. This work needs to be done internally by MS.
Windows 10 1809 is still a preview release with tons of known issues Microsoft is not willing to address. The re-invented clipboard is broken as well and text copied/pasted from one VM to another is garbled. Sure enough, Microsoft won’t fix in 1809 either. I can attest to the old “Ctrl+C doesn’t copy the selected text” bug. That’s been around for years now – it’s sporadic and, in my experience, irreproducible. But I hadn’t heard of bugs in the new super copy app. Do you have links for any of these bugs? I have always thought that was a bit of social engineering to get people to dislike the desktop just a bit more. It was introduced in Windows 8. While no link is available, you can reproduce yourself. Just copy some PowerShell command line containing simple switches (i.e. cmdlet -switch1 – switch2) and paste to the PowerShell console open in a (Hyper-)VM. The hyphens get removed… Worked in all previous Windows versions without issues. This pile of muck called Win 10 and the so called “experts” at MS, just keeps getting worse and worse. I think that in trying to create a “better more secure” OS, they have instead created a giant out of control monster. I can confirm “Drag and drop file extract does not ask about overwriting, and file is not replaced” with build 17763.55. This bug should never, ever, ever, have made it past beta test. Microsoft needs to be in a position where each new update is production quality from day one; a world where updating to the latest and greatest release is a no-brainer, a choice that can be confidently taken. Feature updates should be non-events, barely noticed by users. Cutting back to one release a year, or one release every three years, doesn’t do that, and it never did. It’s the process itself that needs to change: not the timescale. That’s how ChromeOS works. Yes, I know ChromeOS is considerably simpler than Windows. But in the end… do I really care? If ChromeOS can keep on innovating, while Windows keeps on crashing, where’s the incentive to stay with the old tired horse? Another great point that the article and some comments make is that Windows developers shouldn’t knowingly check in broken or unfinished code, only hoping to be able to fix it later. Everything that makes it into the main Windows development branch should be an attempt at release quality software, which it clearly isn’t. Known issues like OneDrive files causing blue screens making it into the fast ring should be an unacceptable quality of work from the programmers. In other words, never knowingly make the code base worse by checking in broken code. Another personal anecdote. Fired up my 1809 machine and tried to get it to print to my WiFi printer. No way. Uninstalled and reinstalled drivers, changed drivers, unplugged and replugged everything, rebooted, and the 1809 PC just doesn’t see the printer. So I pulled out my Pixel 2XL. Clicked Share and 5 seconds later, the page is printed. I take it you checked the printer mfr.’s website for newer drivers and there were none? I take it you also checked Device Mangler to see if Windows saw the printer, but put an exclamation mark beside it and disabled it because Windows just didn’t like something with its hardware or driver(s)? Since it’s a WiFi printer, maybe it’s seeing it as another kind of network-based device besides a printer? Yep, latest drivers on PC. Firmware updated on the printer. Device Manager doesn’t see it. On reboot, nothing found. On manual addition of IP address, nothing found. Easy solution: I email myself anything that needs to be printed. Pick it up on an iPad or Android phone, from where it prints directly. Hmm…perhaps try re-enabling SMB1 via the registry in Windows 1809? I have a feeling that this may be the issue. Yeah, I know that SMB1 (if enabled) is supposed to be a really huge security hole for malware which encrypts all files of specific file types on the local hard drives and on all network shares. I have never considered the SMB1 thing to be a major issue as long as one is using an AV program which instantly alerts the user whenever any new and unknown process tries to run, or if the user is running one of the new AV programs, on top of their primary AV software, which is designed to detect encrypting ransomware. There are at least three anti-ransomware programs on the market which are designed to not only detect and undo any encrypting ransomware damage, but also are designed to run peacefully and side-by-side the user’s preferred AV program. A couple of months ago, I researched these programs. The one which stood out was the program from Zone Labs. Why did it stand out? Because their ransomware program was inherently designed to allow the encrypting ransomware to merrily run — up until their program had gathered enough data in order to be 100% reliably sure that it could then stop the ransomware and then fully decrypt all of the encrypted files. Again, note that my last investigations of such anti-ransomware programs was a couple of months ago, and that there may be new or updated products from the various AV vendors. The only upshot which I have with regards to such anti-ransomware programs is that, at the time, I preferred the Zone Labs approach to defeating all ransomware since their solution is supposedly 100% successful. Appreciate it, but this is a reference machine (my only excuse for using 1809) with as few tweaks as possible. It’s a “feel your pain” kind of machine, intentionally kept as vanilla as possible. Mirror image of the feedback here: https://i.imgur.com/gjAREzA.png Because feedback links are too limited and also too broken to be trusted. I had to make multiple attempts to find it again, because apparently my account that created the aka.ms link doesn’t have access to it. I can attest to the old “Ctrl+C doesn’t copy the selected text” bug. That’s been around for years now – it’s sporadic and, in my experience, irreproducible. But I hadn’t heard of bugs in the new super copy app. Do you have links for any of these bugs? Ah, so true. I learned a long time ago to always highlight, then right-click and select Copy, instead of relying on using Ctrl-C. 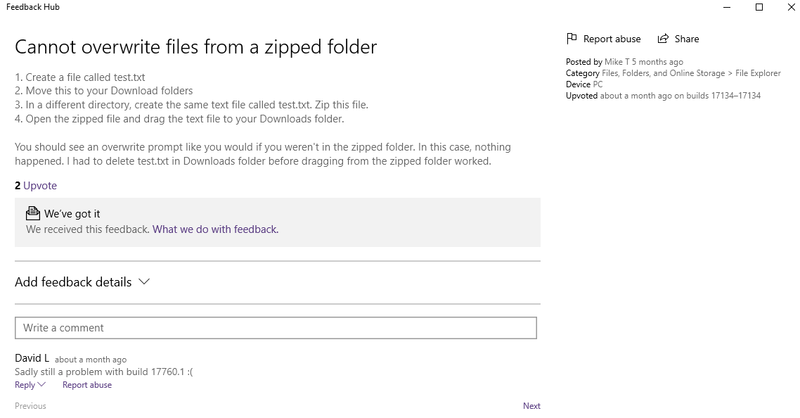 Thought I would give it a try here on Win10 Pro 1809 17763.55 (yeah I went against the wise advice in here and installed KB4464330 to rectify a little Networking Problem) and I can confirm that if you extract a folder, using Windows bundled Zip utility, with a text file (Notepad) document inside and radically amend the text and then Re-extract the same folder from the Original, it wont overwrite the original extracted text file or even give you a choice of replacing, it just ignores the original extracted file, however deleting a folder or file from the original extracted folder and extract yet again to that folder will still replace the missing file or folder. Curious behaviour never noticed here before but then again I always pretty much install 7Zip from the get go and that handles my Zip file needs being a whole lot quicker and negating the need to create a folder in advance, as for the Printer its connected by USB and shared by several Machines and there’s no worries there. Wireless works pretty much as billed but I seldom use that if ever, preferring Ethernet, but as my Laptop travels with me I had to check it out. PS However “Drag n Drop” from another location on to the original extracted file does give the option whether to keep the original, overwrite, or keep both. If you select overwrite it will restore the originally amended text as it should. The risk here is that this is also an internal Windows tool. It might accidentally destroy user files during system operations. Not good. I think this shows conclusively how Windows 10 is being developed now : Little or no testing before adding code (and doing nothing to fix bugs even after they have been reported). Should we be surprised anymore that serious bugs like those in 1809 were allowed to pass and be shipped as final code to users? Such problems are only going to persist, and becoming worse, with each Windows 10 “Feature Update”. The real question to ask is, “Who the heck asked for frequent updates?” Businesses certainly didn’t. And I agree wholeheartedly. Why is it necessary to release big updates twice a year? Peter Bright seems to think that these “frequent updates” are not the problem, but I would think the frequent updates most likely have an impact on the stability of the software, as less time will be available for testing and bug-fixing. Avoid Windows 10 like the plague if you can. I pity those who have no choice but to use it and were bitten by these bugs. Well put, but… a little over a year from now, Win7 users are going to be between a rock and a hard place. If Microsoft were making cars… there wouldn’t be an end of lawsuits rolling in. Now it’s only software and apparently anything goes. Release the c***. If it was any fun, we could call it a joke. But it’s not even remotely fun. It’s a joke.